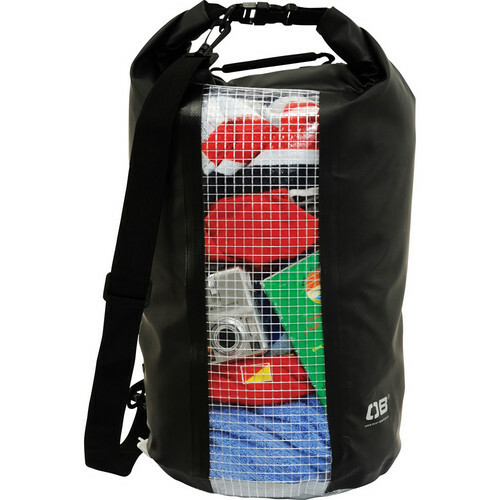 The black OverBoard Waterproof Dry Tube Bag with Window, 30 Liter is used to protect equipment and gear while involved in water sports, boating, camping trips, hiking expeditions, or the beach. It is a 100% waterproof 600 denier PVC Tarpauline roll-top dry bag with an OverBoard Fold Seal System that will float in the water. It is designed to keep various equipment and gear safe and dry. It is carried by a heavy-duty grab handle and a removable shoulder strap. This tube bag will hold 1800in³ (30 Liter) of gear. Box Dimensions (LxWxH) 19.3 x 10.0 x 1.0"
Waterproof Dry Tube Bag with Window, 30 Liter (Black) is rated 4.0 out of 5 by 1. Rated 4 out of 5 by papi10 from fast and good service fast delivery and service. looking forward to using the bag soon.